Greece and Rome can often seem very foreign places to any historian looking at them- for all kinds of concepts, democracy, republicanism, rulership, imperial power, citizenship and freedom, we derive our understanding from them but we have changed the meaning of the concept and often as in the case of democracy the meaning of the word that they bequeathed us. Sometimes it pays though to look back to see how features of our own society are neither permanent nor inevitable, but local variations which have occured in this time and place, and which may in the future fade away as our era passes. which can be easily transalated, roughly as "I don't care to know whether Caesar you are a black of a white man". Rather an odd line if the Romans thought that Romans were white. Similarly in the Illiad, the Achaeans become white through the dust kicked up by their horses. The Homeric epic uses a word analogous to white, leukolenos, 39 times but every time the bard(s) applied it to a woman and on 24 times to the queen of the Gods Hera- at no point are we told that a man is white. 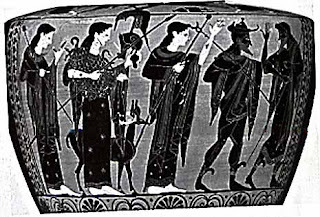 In the Odyssey similarly the words white and black don't denote race but denote gender- so Odysseus himself is at one point described as black. Just look at the vase above and so many Greek vases, where women are white having stayed in doors all day and the men are bronzed by the sun having worked in the fields. Why should this be so? If you think about it for a moment it becomes almost self evident. For the Greeks and Romans there were two major distinctions within humanity. The Greeks saw themselves as superior to all the other human beings in the world- the rest of the world spoke nonsense, ba baing in their confusion, hence our word barbarion. The second major distinction the Greeks admitted was that between themselves and Slaves. The Romans kept the second distinction, but their definition of the first was more elastic- allowing non-Italians to become citizens of the eternal city. We might summarise this by thinking that in Greece and Rome there were two sorts of people, those who were entitled to be household leaders in a world of city states, those who could run households and be in positions of command- almost all of these people were men and citizens- and those who couldn't, foreigners, slaves, women etc. But it remains fascinating that race emerged as a category in late Antiquity and the Middle Ages, as the Roman world collapsed, as the Muslims conquered the near East and ruptured the ancient Meditereanean, turning the world on its head. The first Blacks were like Othello the Moors, not Africans necessarily. Race like nationality was invented at a specific point in history by a vast variety of authors and thinkers- but it was probably unknown to the ancient world, consumed in other bigotries. Before that invention though Catullus by saying that Caesar might have been black could have been making a jibe not about his nationality but about his masculinity. Never a poet to turn down a scurrilous jibe- Catullus looked at vases like that above and knew just the way to hurt the General's masculine pride. Race was long ago exploded as a category for judging human biology- now it seems we might have to see it as a much more recent invention- time to revise the idea that black and white are eternal verities that all human beings have always recognised- they haven't, other divides like that between Hellene and Barbarion, free man and slave, man and woman and of course civis Romanus and foreigner divided the ancient world. I think that, in Greek and Roman times, the Medeterrean was seen as a sort of common arena. As such, differences between Southern Europeans and North Africans had less salience than they do today (and, in contast, a stronger distinction was drawn between Northern and Southern Europeans, because they weren't really in the Graeco-Roman cultural world until v late). There might be something in that- Dee reports that in Lucian, a later author there is a mention of the distinction between Nordic and Meditereanean races but he doesn't elaborate on any earlier citations- maybe they don't exist. interesing post- horribly difficult area , imagine trying to get the modern world views on race form a few hollywood move, and random artiles and poems! I think key is that colour is a secondary sexual sign (women are slighly lighter ceteribus paribus) -so in a world where just about everyone is a similar phenotype that can previal over racial differneces. As for race being meanginless biologically I think that's only insofar as it's seen as a barrier (which it is only where a few geogrpahic barriers eg the Sahara, the berring striat and the Aritic have existed) rather than a spectrum, eastern iranians are less related to zulus than they are to egyptians - though which "race" there in depends on cultural decisions. Very interesting post, as ever. As someone with a very amateurish interest in things classical, not to mention a semi-professional interest in politics, I have to say this blog is an endless source of delight. For what it's worth (almost certainly not enough to cover even a bite-size Mars bar) I'd always understood that Catullus's line about Caesar was a pretty explicit reference to claims that the man-who-was-not-quite-king was happy to sleep with both men and women. Edmund I always understood the men women thing in Greece- lighter complexion for women- being an economic thing- in the sense that a rich man had a wife who didn't need to go outside to work but could stay inside. If you think about today's eroticisation of tans then its the reverse- rich people sun themselves on beeches. I can't comment more than that I'm afraid. As to what you say about race- I suppose what I'm getting at is that the conventional Victorian view of races doesn't make sense at all. Obviously people who mate together and have done for a long while will have similar genetic histories- though as I understand it that works best in small isolated communities that adapt to particular environments. The races don't help very much- you are right its contacts across sea and land that help. However the variation I think is very small and furthermore I'd say that the most extreme variations are amongst people who are very isolated and of whom there are not many. Its not an area I know much about but that seems to me to be the best way of thinking about it but there definitely say isn't a huge difference between all Africans and all Europeans or all Asians etc. Beyond that I'm unwilling to go and anyway I think that most of these genetic differences are so small as not to matter. Unpremeditated yeah that's how I read it too- I was trying to find a quote I seem to remember from somewhere about Caesar's liberal distribution of sexual favours but I couldn't so left it out but yeah I agree- and it relates back to the central point that balck and white are about gender not race. The Romans must have seen plenty of North Africans - but they are just mediterranean white men. They presumably saw virtually no-one from the Far East, and few sub-Saharan Africans. The Portugese and Spanish used to distinguish "white" and "black" slaves - the former being European, North African and Canary Islander, the latter sub-Saharan. I'd be surprised if they didn't have a concept like race. All your post really shows us is that they did not use colour to signify race. Secondly, race is far from a homogenous concept in the west - for instance the Americans have many more races than we do, and they seem to be obsessed with the concept. It's also clear that at least here, race construction is not just about physical appearance - consider the racial construction of muslims, as distinct from indians, as distinct from jews. Dearieme- as I understand it and here I'm stepping right out of my knowledge base- they did probably know plenty of people who looked black in today's terms- lots of Egyptians for instance looked black. The Portugeese Spanish example that you cite seems to date from over a millenia later- same period say as Shakespeare's Othello. Marcin- yes I agree race is a concept which is unlinked ot real physical distinctions. My sense of the evidence that the paper puts forward is that the primary distinction was between civis Romanum and barbarion- with other distinctions like ones based on language Latin, Greek or barbarion tongues as well. Whether that is suitably described as a racial distinction and how we label distinctions is a whole other debate. I suppose what the article demonstrates is that Romans didn't think that the categories that we think are important were important, not that they didn't have categories- it all comes together though to support your point that these categories are constructs. As you say, the Portugese were a millenium later. As for Egyptians, I take your point; but perhaps if Egyptians occupied - as they do now - a whole spectrum from light to very dark, the effect would be less dramatic than coming across a whole very dark population. I don't disagree with your fundamental point; things were different. I suggest that the big change might have arisen with the trans-Saharan Islamic slave trade and the trans-Atlantic Christian one. My last suggestion was rather silly. The Portugese and Spaniards made the white/black distinction before the transatlantic slave trade. Which leaves the muslims as prime suspects. Part of their legacy to Iberia, perhaps? Fascinating post. I don't have much to add save to point out that painting women white is a peculiarity of the black-figure period, and isn't seen much on red-figure or white ground vases - except on the vases of (the culturally conservative?) Greek colonies of South Italy, i.e. Apulia. Dearieme- I think I agree with you there- the great division being later. Yeah the slave trade, the division of the Med etc all play their role I suspect, I'd need better knowledge to say what was happening. As to Egypt I honestly have no idea. Yes thanks sorry I took you as more hostile than you were- the interesting thing to me is how cultural and hence mutable these things are. Lysias that is fascinating about the vases- have to say I'm no expert but that is very interesting- I'd love more details. You should get a blog and write about it! The emphasis in your translation is perhaps not correct, rather, we have this as 'I do not want to want to know Caesar whether you are a black man or white man.' The quote is about Caesar, not about race.